It’s not easy to photograph animals. Actually, if you think about it, the photography is the easiest part. Getting the animal to cooperate with your efforts is the tricky element. They don’t know what you’re trying to accomplish and frankly, they don’t care either. 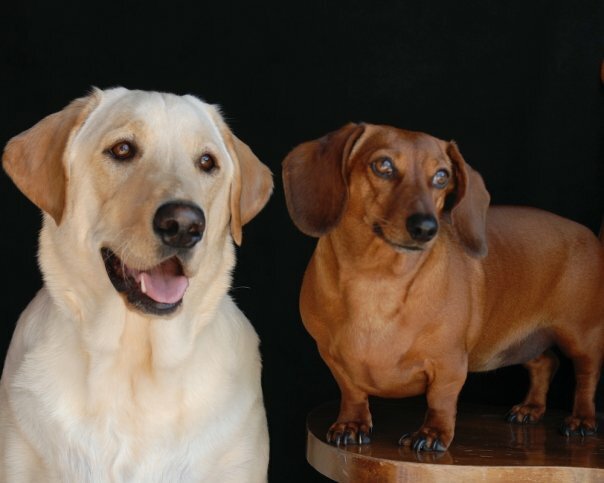 I knew I wanted to get a shot of the dogs together so I staged a photo shoot. I draped a black cloth over the book shelf and used the natural light of a sliding glass door. Then I needed to get their heads at an even height so I pulled a chair from the desk. That was the easy party. Getting them to both look at me (while I was holding a camera) was the difficult part. I had lots of trash shots before I came up with the brilliant idea of holding string cheese which just happens to be their absolute favorite, forbidden treat. Whenever I open a package of string cheese they both come running. So I got the cheese, put them back in place and began to shoot. I had to make it quick or Charlie was going to drool all over the floor or Daisy would jump off the chair and beg at my feet. I put the camera on the tripod and moved the cheese around in front of them so their heads would be at different angles. IT WORKED! What resulted is one of my favorite photographs of two animals that I absolutely adore.